Heat oven to 350°F. Line 24 muffin cups with paper baking cups. Prepare and bake cake mix as directed on package for cupcakes, using water, oil and eggs. Cool 30 minutes or until completely cooled. Spread frosting over cupcakes. Sprinkle top 1/3 of each cupcake with about 1/8 teaspoon decorator sugar to form Santa's hat. 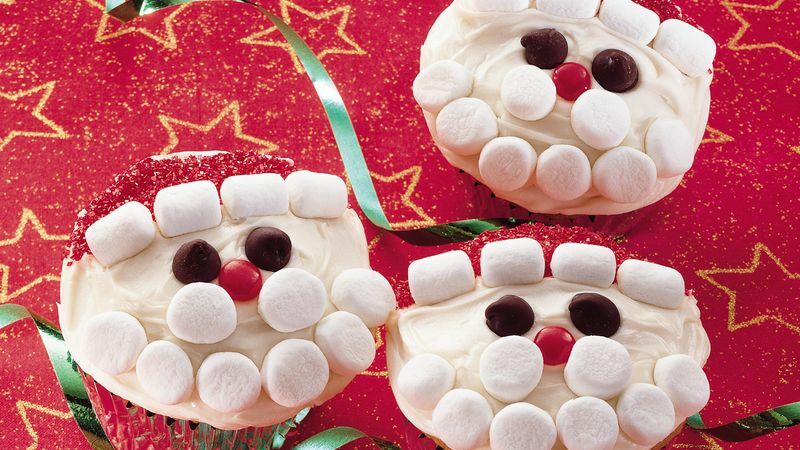 To make each Santa's face, place chocolate chips for eyes and cinnamon candy for nose. Cut 2 marshmallows in half lengthwise; arrange to form rim of hat. Cut 4 marshmallows in half crosswise; cover lower part of cupcake to form beard.